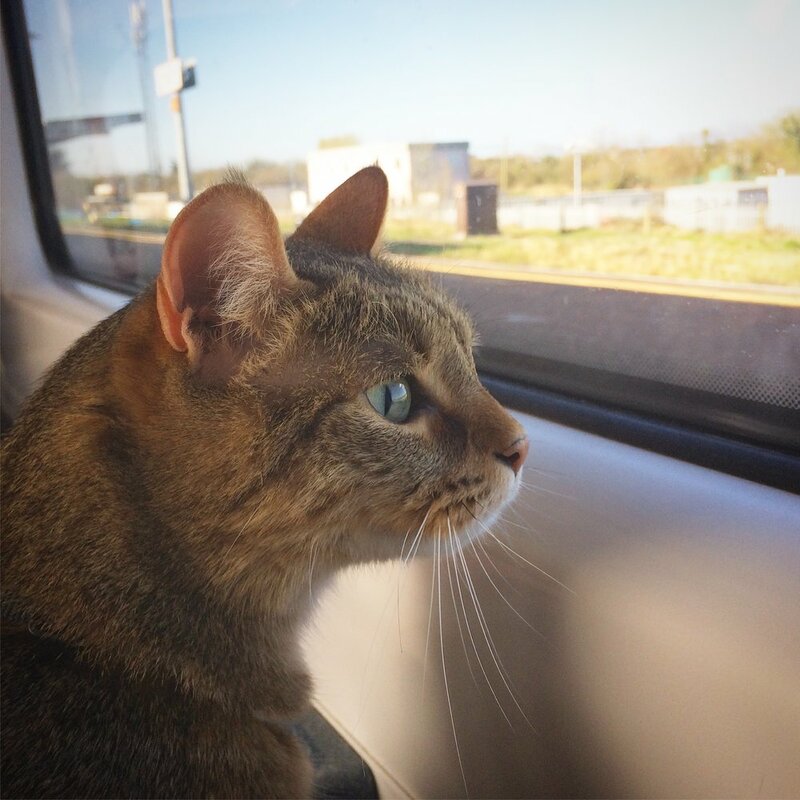 Summer Cat Quest Across England. Your Advice Needed! Summer hiking fun in Oregon, 2017. Best face ever. Last spring, I became aware of a very cool entity called the Oxford Centre for Animal Ethics. When I saw they had a call out for papers for their Summer School this coming July, I decided to throw my hat in the ring. I haven’t been remotely involved in academia since turning in my dissertation at the LSE in 2010, and am not part of any institution, so I figured it was a long shot. However, I am excited to say that they got back saying that they loved my proposal, and hoped I would be able to come give a presentation in July! Needless to say, I’m flipping thrilled. Worried that I’m out of my league and going to shame myself in front of a room of seasoned professionals, but thrilled. After much deliberation, I’ve decided that if I’m going to travel all the way to Oxford, it would be silly not to tag on some other adventures in the area. And if I’m going to go on adventures, I of course ought to bring along my #1 adventuring companion, aka my cat, Aífe. I’ve thought about where we might go. There are loads of famously gorgeous places I would like to see in the UK (many of which have glorious Instagram accounts). However, my trip over there hinges on Oxford, so it probably makes sense to look for something in that area. And there happens to be one quest I know I would like to tackle there: The Thames Path. It’s a National Trail that runs 184 miles from the edge of the Cotswolds and through Oxford to Greenwich in London (you know, the place where Time began). 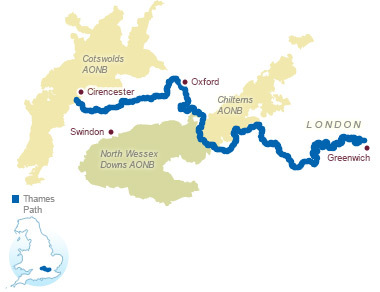 The Thames Path, as outlined on the National Trails website. If you’re familiar with our adventures, you’ll know that they’ve got everything: trees! flowers! birds! ice cream! bunnies! bicycles! trains! mountains! castles! boats! planes! rivers! hikes! seasickness! books! naps! art! dentistry! graveyards! cheese! This adventure would be pretty much all of those things rolled into one massive pilgrimage of radness (though hopefully we can give seasickness and dentistry a miss). The thing is, there’s a few quandaries that need solving if I’m going to make it work. And I only have a couple months to either get a plan sorted, or scrap it. And meanwhile, I have to get together a presentation good enough to impress a room full of experts and lawyers in flipping Oxford. So I’d really appreciate your two cents in figuring this out. If you’re interested, please read on. Where do we sleep? And how do we pay for it? Aífe hates being zipped into a tent. Assuming that I could get past that hitch, The Thames Path only has a few areas where you can camp. Mostly, it seems like the only places to stay in many villages would be B&B type places. Which sounds lovely, but it takes about two weeks of straight walking to complete the trail (at ~13mi/day). Oxford aren't paying for any of my travel there, so my husband and I are already going out of pocket for me to go over, and I can’t afford two or more weeks of B&Bs on top. Airbnb isn’t any cheaper in this case, and youth hostels don’t allow animals. And I don’t know anyone in rural England, so I can’t crash on friends’ floors the way I would somewhere like California. I’ve been reading Simon Armitage’s Walking Home, where he gives poetry readings in exchange for lodging along the Pennine Way. I’d be delighted to work out something along those lines, but he’s an award winning poet, as well as a local in the region he was hiking, and I am neither of those things. And I’ll have a feline in tow. I’ll need a different schtick, for sure. Can I write my way to success here? In response to my concerns over how to cover the cost of lodging, my husband has suggested I try to find a paper or website that would want to pay me to write articles or blog from the trail, or perhaps find a company that would want to sponsor me. I’m not sure I can imagine a company that wants to throw money or products at a cat-lady rambling along a National Trail, but I would love to be proved wrong. Anyone want to prove me wrong? I can, however, imagine people wanting to get a glimpse into my adventure with Aífe. The internet is nothing if not cat-obsessed. I’ve been interviewed about our travels a couple times, and have had people reaching out online to say how much they enjoy the photos and blogs of what we’re up to. I’ve also had lots of people getting in touch to ask questions about how to take their own cats out into the world. I love writing, so I’m totally up for writing and chatting about these topics until the cows come home. I like to think I have the potential to be the Michael Palin of pet travel, but that could very well be just a fantasy. Still, I’m working on a list of publications and platforms that might be interested, and trying to work out which editors I should be pitching to. But I’m aware that selling myself isn’t my forte, and I’d be hugely grateful for any help in this realm. Anyone out there know any editors or other media folk who like stories about women, travel, and/or cats? Is this an all or nothing situation? Do I have to go to the source? One way to make it a slightly more doable trip is to not start from the source of the river, but just go from Oxford to London. That would shave off a few days of walking and lodging. And from reading the National Trails website, it looks like a good chunk of the first part of the trail is actually along a motorway. They suggest taking a taxi, which sounds lame, yet I don’t love the idea of carrying my cat along the edge of speeding traffic either. Also, it would be a lot easier in terms of brainpower and time to finish worrying about the conference before I set out on the trail. I think I'd enjoy the journey a lot more once the conference was done, and I think I’d feel plenty happy and accomplished with ‘just’ walking 130 miles (plus many small sight-seeing detours) of trail between Oxford and Greenwich. But it might not sound suitably impressive to others if I don’t do absolutely the whole path. What do you think? What’s the bigger picture here? Ideally, I’d like to not just go on a romp for my own benefit, but have it benefit others other people and critters. Writing and awareness-building are obviously a huge part of that. But maybe there’s a way to do more? Like collecting pledges to go to an animal organization? Or…? Of course, it takes a lot of train and ferry travel just to get to England from Berlin. Ferries aren't our favorite, but trains are fantastic. I’ve wanted to do something like this for a while. But I’ve only just started trying to take all my floating scraps of ideas and integrate them into any kind of a serious plan a couple days ago. So that plan is still only half-baked. There’s still a chance to have a huge impact on the plan. Which will impact my book. So this is like a choose your own adventure book, only it’s also for a real-life adventure, too. I'll keep puzzling away at it here, but if you have any ideas you’d be willing to throw into the mix, I’m absolutely all ears. Get in touch via the Contact page, leave a comment, or shoot me a DM on Instagram or Twitter.